If you're thinking of picking up the game of golf, you may find the costs prohibitive. One of the major cost items you need for the game is a set of clubs, which can range into thousands of dollars. Clubs that don't come from brand-name manufacturers are significantly cheaper. Knowing about the clone-club market, and how marketing costs impact the price of brand-name clubs can make your choice easier. Cheap golf clubs may not be no-name or clone brands. You can find good, used clubs at online auction sites and second-hand resellers. In addition, regular players often trade-in their clubs, making a used set of good clubs available at a reasonable price. If you're new to the sport, don't assume you have to invest a great deal in clubs. Your swing and style are very likely to change as you mature in your knowledge of the sport and refine your technique. 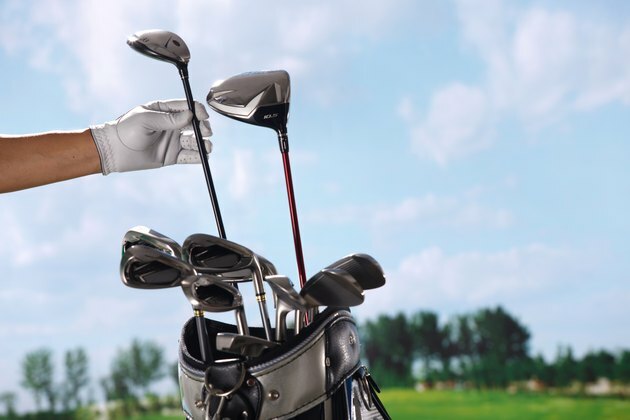 An editorial on Golf Club Clone states that the equipment in a pro player's bag is part of a weekly count used by brand-name manufacturers to incent players that use their brand. The idea behind the incentive is to help sell a particular driver, iron, putter or other club to amateur golfers who see the pros using that equipment. Golf Club Clone.com suggests that the brand-name manufacturers often increase the costs of golf clubs to recoup the expense of getting pro players to use the equipment. Most brand-name manufacturers are relatively new entrants in the market of golf club -- most entered the market about 20 years ago -- while many lesser known brands are still striving to enter this very competitive market. However, because golf club manufacturers patent their design, you can't get an exact copy of a brand-name club, even if you buy a club that's billed as a clone of a better-known brand. As a result, you can't make a direct comparison between a set of brand-name clubs and its cheaper counterpart. If it's important to your mental game to have a particular brand in your bag, buy that brand, but if you simply need a set of clubs to get you started, don't unnecessarily overspend. Regardless of who manufactures your clubs, look for a few items to ensure you're getting good quality. Club heads should be made of stainless steel, carbon steel or beta titanium. Avoid clubs that include zinc or a composite of aluminum and steel; these types of clubs are generally made for junior sets and some beginner sets, but the club heads can't withstand play for very long. Clubs that are molded in casts are less expensive. Forged clubs will cost more. The quality of the manufacturing process is key, and brand-name manufacturers are purported to having tighter control of their quality. If you don't want to invest in more expensive clubs, look for brands that offer a warranty. If you're new, don't pay extra for a custom fit, wait until your game has matured and you're ready to invest in a set you'll have for a longer time period. GolfClubClone: Why Are Brand Name Clubs So Expensive?